They were 122 players, all battling it out in the poker room of Harrah's Cherokee (North Carolina, USA) for the 5th annual World Series of Poker National Championship (WSOP Championship). 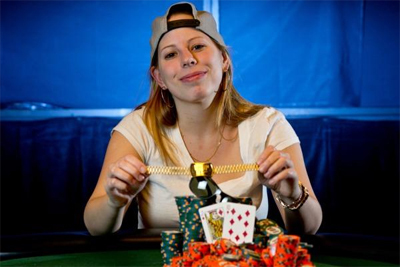 Interestingly enough, it was a 25-years-old female poker pro who sealed the win: Loni Harwood. Of the $ 1.22 million prize pool, the super lucky and talented poker lady cashed $ 341,599. Admittedly, Loni Harwood has come a long way to the victory. She actually found herself teed against tough poker players, namely Phil Hellmuth, John Monnette, Jeff Madsen and Dominik Nitsche. However, none of those big names made it through the final table. In addition to the top payday, Harwood was also granted a gold bracelet. It is the second bracelet she earned so far. Harwood entered the final table as a chip leader. Poker pro Daniel Negreanu was among the contenders. Sent to the 6th rail, Negreanu failed to add another bracelet to his resumé. As for the invincible poker lady, she kept pace to the final showdown against Alek (Alexandru) Masek, an eight-time WSOP Circuit bracelet winner. Masek did not weigh that much facing the poker lady. Runner-up, he would console himself for a $ 211,133 of prize. Finishing 3rd-place was Darryl Fish. May we remind you that the final table will hit TV screens from August 18. Speaking of the upcoming 2015-2016 WSOP Circuit, the first stop will take place at Foxwoods Resort Casino, in Connecticut, from August 6.